A divided Supreme Court said Thursday that Louisiana may not enforce a law that opponents say would close most of the state’s abortion clinics and leave it with only one doctor eligible to perform the procedure. The justices may yet consider whether the 2014 law — requiring doctors at abortion clinics to have admitting privileges at nearby hospitals — unduly burdens a woman’s access to abortion. The Louisiana law has never been enforced, and the Supreme Court in 2016 found a nearly identical Texas law to be unconstitutional. 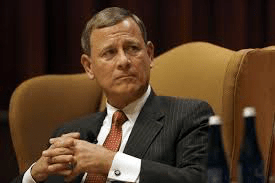 Chief Justice John G. Roberts Jr. joined the court’s four liberals in blocking the law for now. The majority did not give a reason for granting the stay, as is the court’s custom. The court’s most conservative members said they would have allowed Louisiana to begin the process of enforcing the law. Hospitalization after an abortion is rare, all sides agree, and the lack of admitting privileges by the doctor who performed the procedure is not a bar to the woman getting needed medical care…. Donald Trump probably made a mistake when he went after the Supreme’s Chief Justice in public…. “We don’t work as Democrats or Republicans,” he has said, a theme he has returned to while trying to strike a delicate balance as the chief justice….